Wartime Mission:Transport, navigational and weapons trainer, light bomber, photo-reconnaissance, mission liaison, and mothership for drones.The C-45 Expeditor or a variant was initially introduced to the civilian market, but once war broke out, its potential was realized and production began in large quantities. 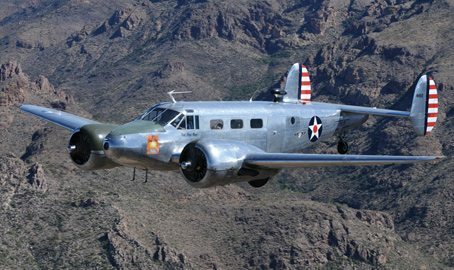 It was used in every branch of American service during WWII and Korea and remains one of the world’s most widely used light aircraft. The Expeditor was still being produced up through 1970 and used for Strategic Air Command, civilian feeder aircraft, business travel, aerial spraying, dry cloud and fish seeding, aerial firefighting, mail delivery, ambulance service, skydiving, weapon- and drug-smuggling, skywriting, banner towing, and stunts. It could be modified with a nosewheel, skis or floats. Price: $175 for cockpit seat, $80/seat for passenger cabin. Passengers must be 5 years of age or older (12 or older to fly in the cockpit). Passengers under 12 years of age must be accompanied by an adult. Minors who fly (age 5-17) must have their guardian complete a Minor Hold Harmless agreement and the guardian(s) must be present on the day of flight. There is a minimum number of passengers required to fly this aircraft. If the minimum is not met 24 hours prior to the flight time, the flight will be cancelled. For safety reasons, all passengers must wear close-toed shoes. No Sandals or flip-flops will be allowed. All flights take-off from and land at the same airport. passengers must be able to board aircraft without assistance.